A True High Country Farmstay set in the heart of the NSW Snowy Mountains the ideal base located just over 10 mins from Jindabyne. Open Year round we offer families the best of both worlds for a winter or summer Holiday in the snowies. The Farm is a 160 acre working cattle & sheep property with many farm animals, provides every visitor with a true high country experience. Skiing, Snow play, walking and exploring the Kosciusko National Park, Perisher . Resorts 45 mins away, are great fun but can be tiring for young children and adults, we offer a perfect place to come back to each day. Parents get to relax in front of the fire and the children are kept busy and entertained with the many farm animals, playground and exploring the farm. Toast marshmallows over our open camp fire, collect free range eggs; pick your own home grown vegies to cook, herbs and strawberries when in season. Pizza Oven and now Offering 2 types of accommodation. We offer accommodation for families on the Farm. 5 & 7 Night Rates Discounted.Contact us for prices. Our property has an AAA 3 star rating. One Bedroom Self Contained Units sleep 4-6 people each. 3 x One Bedroom units, ideal for large families or groups of up to 18 people. Each one bedroom unit has a queen bed and 2 sets of bunks separated by sliding doors for extra privacy. * Fully equipped kitchen with fridge & freezer, microwave, gas cook top (no oven), pots & pans, cutlery & crockery, toaster plus tea & coffee facilities even a basket to collect the eggs for breakfast. * PIZZA Oven and BBQ area. * All linen & towels supplied. * Use of the guest laundry & drying room for fishing & ski gear. Our comfortable guest lounge, featuring country furnishings and a cosy log fire, is the perfect place to relax. You can read one of our books or magazines, watch a DVD movie on the Digital TV, play games, listen to your favourite CD or enjoy a dinner party. Try out the PIZZA OVEN or Cook a BBQ in the covered area, while the kids entertain themselves in the play ground. The Farm and things to do in the area! It's all about the kids, there's plenty of room to run, bring your bikes to ride & explore in a safe environment with tracks over the 160 acres. Meet, interact and feed our animals- chickens, ducks, geese, turkeys, pet dogs, cows & bull, sheep and lambs, our 3 horses Jindy, Lilly and Raine. Collect your own fire wood, make a fire & toast marshmallows over our open camp fire, collect free range eggs; pick your own home grown vegies to cook, herbs, strawberries and Fruit when in season. On a clear night see a million stars or take a torch lit walk in search of possums and owls. We are surrounded by our pristine high country, boasting exceptional views from many parts of the property. Watch birds, kangaroos and other wildlife in natural bushland from one of our walking or mountain bike tracks. many marked walking tracks in the Kosciuszko National Park. Snow Play, Skiing and boarding or Ride the Ski tube railway to Perisher & Blue Cow. 45mins away. Snow Play, Skiing and boarding, Take a chairlift to the top of the mountain or a bobsled ride, with a fantastic indoor heated pool with water slide and the giant inflatable. The Kids love it. 45mins away. Lake Jindabyne with Fishing, sailing or water skiing, we have plenty of parking for the boat & trailer. We are located between two of the most popular fishing spots; Lake Jindabyne & Lake Eucumbene. Fishing charters and lessons are available from renowned local guides. Only minutes away is the 5 star Jindabyne Equestrian Resort for horse riding and lessons with beautiful mountain trail rides. Horse riding and pony rides are also available at Thredbo Valley Horse Riding 25 minutes away. The township of Jindabyne with its many specialty shops, supermarket, restaurants, cinema, nightlife, Bars, heated indoor pool and Skate Park for the kids is only just over 10 mins away. Step back in time at the Coolamine & Currango homesteads & huts of the high country. Wildbrumby Schnapps Distillery on the Alpine Way. Snowy Vineyard Estate near Dalgety. Shower room with hand basin and toilet. Living Room located in the Guest Shared Lounge in the adjoining Farm House. Cooking pots and pans, Dishes and Utensils for 6-8 people. Kitchen/Dining. Gas cook top with microwave oven. Bench space and sink. Refractor and Dining table for 6. 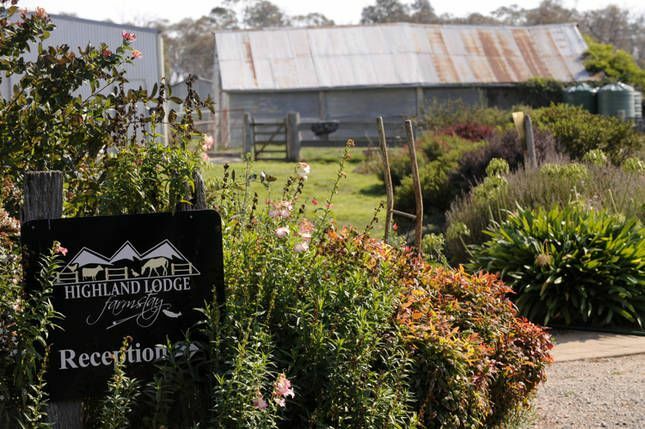 We loved our stay at Highland Lodge Farmstay. Owners Gwen and Bob made us feel like one of the family and gave the kids run of the farm. My daughter loved feeding the chickens and turkey, grooming the horses and especially the discovery list. The farm was quiet and peaceful but still close enough to all the activities we wanted to do in the area. The accommodation was clean and well designed, comfortable for all 5 of us. I would highly recommend and can’t wait to go back. Lovely property. The animals are fantastic and the location is convenient to the ski resorts. A great place to stay with kids. A great place to stay with kids. They enjoyed the farm experience feeding the chickens and playing with the toys especially the billycart. Accomodation was basic but clean. We enjoyed our stay. Warm and cosy accommodation, and comfy beds. Bob and Gwen met us on arrival, with a warm and friendly welcome. We made good use of the outdoor cooking facilities and the fire pit was a huge hit. It was the perfect place to stay for our snow trip and would love to visit again. Thank you. My family and I really enjoyed this property. Gwen and Bob were fantastic hosts. They took the time to get to know us and shared their insights and stories with my inquisitive 'City Slicker' kids. They just loved every minute of their stay and my wife and I felt very relaxed after our stay. A great place to stay Summer or Winter. Highly recommended. Kids enjoy the facilities in the property. The playground , Wood Burning Fire place and the hand pick fresh eggs from chicken house make good memory for kids.